Meetup’s site and apps will be down for about an hour beginning Sunday, November 9th, at 7am EST. We wanted to give you a heads up so you can plan accordingly. We’re doing some routine maintenance work that requires taking Meetup offline briefly—we do this from time to time to ensure Meetup is as up-to-date and speedy as we all want it to be. Thanks for your understanding! Great Meetups are made of great members who care about their communities. These members know that organizing a Meetup takes work, and in addition to the planning, scheduling, and coordinating, it also takes money. Whether it’s jerseys for game days, craft supplies for projects, rental fees for equipment, or even just snacks, we know that sometimes it takes stuff—in addition to awesome members—to make awesome Meetups happen. We want to make it easy for supportive members to chip in on costs and help make Meetup groups even better. That’s why, as of today, we’re adding a “Chip in” button on group and event pages, allowing members to contribute, no matter what device they use to access Meetup. Chipping in is a great way to help cover costs and strengthen the Meetups you love. Stronger Meetups mean stronger communities, and it’s up to us to make it happen. Currently, chipping in is only available for our US-based friends. Stay tuned for international chip in options—coming soon! Have questions about Contributions? Head over to our Help Center. We’re happy to announce that we’ve joined forces with The Pew Charitable Trusts’ Voting Information Project and The Internet Association to help voters Get to the Polls on November 4th for the U.S. Midterm Elections. The Get to the Polls site provides voters with a simple, central location to find everything they need to make an informed decision on Election Day. By entering their residential information, voters will be able to find their polling place address, hours of operation, and full ballot summary with just a few easy clicks. At Meetup, we’re setting out to make local community real. We believe that everyone should have a voice in their community, and voting is one of the most important ways to make that voice heard. Through Meetup, people come together to make their communities stronger, healthier, happier places, and choosing our elected officials is an important part of ensuring those communities continue to thrive. Creating the communities we want to live in is important work, and it’s up to all of us to do it together. Voting is a critical piece of that work, and we’re thrilled to see Get to the Polls making it easier than ever. If you’re a United States citizen, make sure to check it out, and on November 4th, don’t forget to vote. Stay up to date with the latest from your Meetups with notifications on the go. We’ll alert you to new comments, likes, photos, and more, from right inside the app, so you’re always caught up. Notifications are now available on both iOS and Android. Wondering why your top navigation bar looks a little different? We consolidated your links into two new drop-down menus, offering you a more centralized navigation experience and a cleaner look. 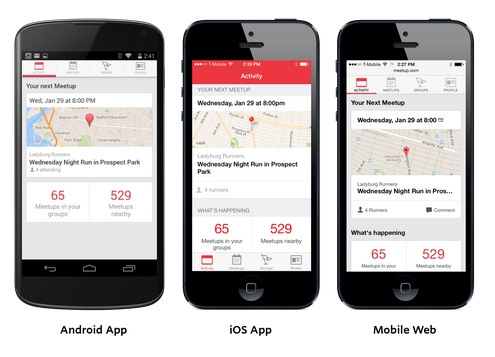 We’ve redesigned Meetup’s mobile experience, offering mobile web, iPhone, and Android users a cleaner look and a seamless experience across platforms. Your Meetup Group’s settings aren’t static, and neither are you. Now you can update your settings on the go using your mobile phone. 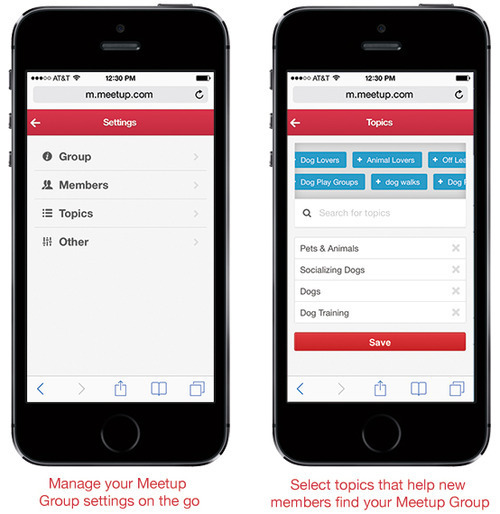 Tidy up your Meetup Group’s topics, spruce up your description, or edit your new member message anywhere you can access mobile web. These options are currently available on mobile web. They’re coming soon to your Android and iOS apps. You can now create and edit Meetups fast, easy and on the go with your mobile phone. 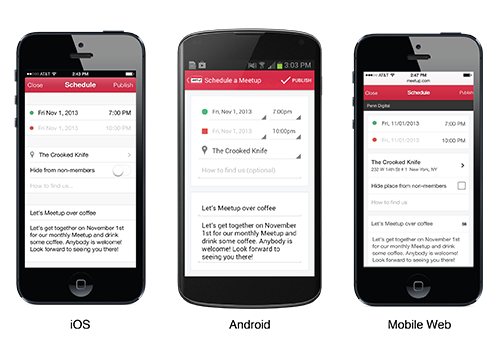 Schedule Meetups with iOS, Android or mobile web. Need to make a last minute change to an upcoming Meetup? Grab your phone, edit the detailsand notify members with a few easy swipes. Spark Meetups anywhere, everywhere, instantly. Learn more.